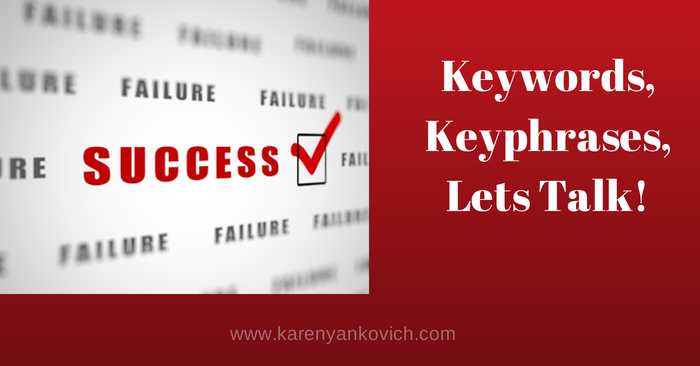 Keywords, Key Phrases, Let’s Talk! You’ve poured your heart and business knowledge into a blog post so now what? Well, you have done the hard part my friend, and the rest is fairly simple but very very important to making sure you will get eyes on your prize piece. Quite simply, you now need to make sure your beautiful post has the words and phrases the people who want and need YOU will be searching for online. Not a lot of keywords and phrases, just a few, but these valuable few will work magic that your compelling content has less a chance of doing on its own. This valuable info can and should also be used consistently in your social media profiles (ahem – LinkedIN! ), social media posting, and web copy! So let’s work some magic shall we? It’s not hard to work magic with keywords for your content. First realize that these key phrases are a component of SEO and SMO, and get to the very heart of your business, your why, and therefore lead your business marketing campaign. Why do your customers love you? Are you cheap? Or are you the best? Do you provide ideas or help? What is a successful outcome your customer or client will gain? Explain your business to a 5 yr. old? What words come up? The best keyword phrase length is 3-4 words strung together. These are considered long-tail keywords, and a great way to get specific and really see what your clients are asking for when they search for your niche – e.g. blog post tips, social media school, men’s basketball shoes, effective life coaching, successful social media strategies, essential oils for calming, etc. Once you have brainstormed your list of words and phrases that explain who you are and what you do, it’s time to play. There are a bunch of tools on different sites that will help you determine which of your words and phrases are the best to use. How many people have typed that phrase in a Google (or Bing, etc) search? Are you competing with a LOT of other sites for that word? Giving other key phrase suggestions as well. Most keyword sites all have free and paid membership levels that obviously give more information the more you pay. But the free sites are still very robust. For example one super quick and easy way to help brainstorm your list above: Just type a word into Google search bar and see what populates! Here is a list of all the websites that offer keyword and key-phrase tools to use at your leisure. First step today? Answer the above questions and start jotting down those phrases. Second step? 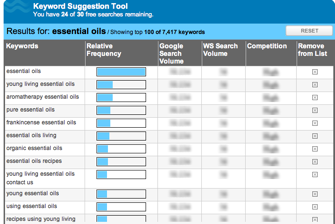 Try one of the keyword tools and start crunching some numbers. Need help? Join my LinkedIn group and post your question! You will have a forum of others, including myself, responding to you with ideas, suggestions, and encouragement. Keywords and phrases can be confusing, you don’t have to go at this alone! Enter your keywords one by one and go to town! Beware you get only 30 free searches here to make sure you have brainstormed first and are ready to test out only your top words. 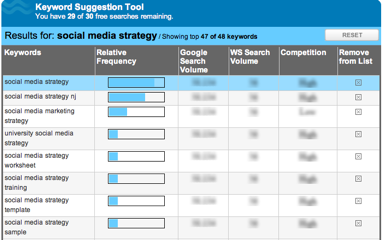 Social Media Strategy: See how now I know which words pair best with social media and are searched for the most? Marketing, worksheet, and training are all top hits, so it would behoove me to use these two phrases the most when blogging, posting or writing web copy. Funny how NJ is a top hit as well – which is where my business is based! The other areas are grayed out as a paid subscriber level only service. But we get enough of a picture to know how to proceed. Essential Oils: Do you have a product based business? Type in your product and get instant ideas on how best to use your product in a phrase or a sentence, at the very least in your title, topic headers, and descriptions. Let’s take a look. You can see that just this product name is strong. Paired with words such as young, pure, aromatherapy, and frankincense are all top draws as well. 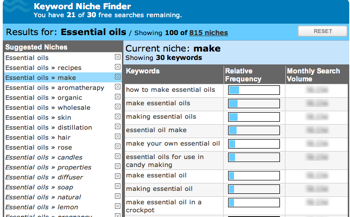 I continued to scroll to the bottom of the first page list and found “essential oils a-z” at the bottom, though still a high number of searches, it is interesting that this particular phrase is just not as popular as others, so when describing a catalogue or an advice list you might be better off with “organic essential oils a-z” or “pure essential oils: the top 10 dos and don’ts” etc combining popular with less popular to stay high in search frequency. Now you can see specific phrases that will gain you the most results! 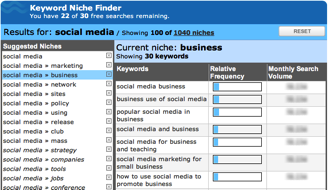 Click on each descriptor or niche on the left and it populates the list to the right with the current keywords for that niche. When talking about essential oils clearly the best phrase to use in your profiles, headlines, posts and web copy is “how to make essential oils,” getting specific with crock pot or candy making does not help your niche at all here. 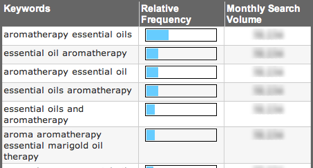 Here’s something that’s even more interesting: when I clicked on aromatherapy niche on the left, I saw that hands down the most popular search was the phrase, “aromatherapy essential oils” and not “essential oil aromatherapy” as well as the plural vs the singular form of the words. Subtle difference with big impact! SEObook you must sign up for a free account in order to gain access to their keyword tools. I did and beware the sign up confirmation email went to my spam folder. Once you have a password and are logged in, click on the Tools Tab and then Keyword Tools in the drop down menu. Take out your brainstorm list and enter your related keywords into each box. Make sure you have a few in each box to make this search more robust. I used the Broad setting to generate as many key phrase options as possible for me to use. Click Generate and your results populate in the right hand box, creating key phrases based on combining your words in your list. Add these phrases to your brainstorm list to use on ALL of your social media profiles, bios, future posts, blogs, web content when describing what you do and what you are selling! Ubersuggest is an amazing tool to be used at the brainstorming level. Still stuck on words and phrases that may or may not work for you? Try this free tool! The results were too long for me to post here, but I entered the word social media in the query box and a variety of top phrases were shown. The best part of this tool is that it connects your word/phrase with additional words and key phrases alphabetically. This feature will get the ball rolling when you are thinking of how to describe what you do in ways people will search for. You can go even further by clicking on each word that you like to get further suggestions from the site! So those are a few step-by-step instructions on how to use the free keyword and key phrase tools out there on the web. As always, sign up to join my LinkedIn group and post your Q’s to get quick answers from myself and others doing the same thing you are! Loved it when you said….”You’ve poured your heart and business knowledge into a blog post so now what? Loved the ‘fairly simple’ part. Yup, you had me right there. I am going to pay closer attention to this now. Here’s the funny thing Karen…just the other day I was thinking… I need to get my blog out there more … and then, here is your post… so like… what woman? You inside my head? Please keep knowing me so well 😉 (hee hee) …. as it is so helpful. I love your posts! So many great resources here in one post! I like Ubersuggest and wordtracker….but really the simple hack is my favorite: just do a Google search and see what the prompt gives you! I was just trying to help a friend with an organic farm figure this out (how to search for the right/relevant keywords). So I will pass on the info! Holy Moly! This girls love a breakdown as to how to get it done and you are my go to SM girl, just add a cape and wand for super hero status!! Thank you, Karen! This may be a rudimentary question, but… Are keywords the same as tag words? i.e. Are we adding these keywords as tags in wordpress? I’ve done keyword searches before when I set up my other business website. My new online website offering is very niche specific and I found it a bit more difficult to find fitting keywords. I will, however, try again using your wonderful suggestions above. Thanks so much! Great suggestions! The internet is HUGE and getting found can be tricky. I appreciate all of your great tips on increasing the ability to be found. I really liked how you asked how we would explain what we do to a small child. I think that really hits the nail on the head as it is easy to over complicate things. It is also an eye opener to see how much of a difference whether or not a word is plural and the order of the words affects the ability to be found. Thank you for sharing! valuable information here, karen. i’ve decided to block out a space in my calendar one day next week and go through all of these resources you’ve provided. i write from the heart and usually pay little attention to key words. i need to change that and work on a bit of strategy. Great run down on keyword searches! While seo doesn’t have the same importance now that it did a few years ago, it still helps to know and use seo tools. Thank you for the great list.